I don’t know how she does it. Every day Julie Bogart drops into my inbox yet another pearl of wisdom that makes our homeschool more fun. A game, an idea for stimulating big conversations, or simply words of encouragement reminding me to appreciate what’s going well in our homeschool, instead of worrying about what’s missing. 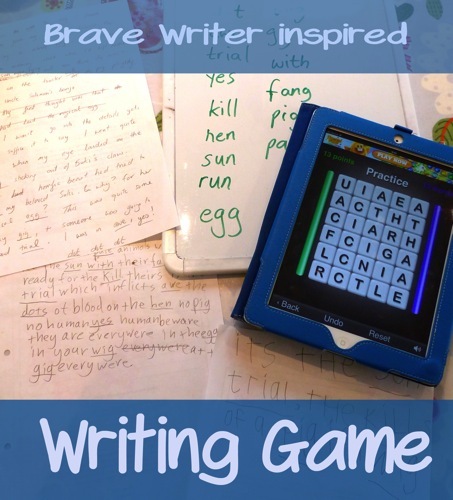 In last Sunday’s Daily Writing Tip, Julie suggested using the game Boggle to generate words to use in stories. We don’t have Boggle, so I downloaded the free app Popwords to use instead. First, we used Popwords to generate a list of words. We let J(9) spot the three-letter-words while C(10) and I searched for longer ones. I wrote all our words on a whiteboard. When we had 15 words, we grabbed paper and pencils. We each set our own goal for how many words to include in our piece of writing. J(9) decided on six words, C(10) thirteen, and I tried to use all of them. The game was so much fun. We all smiled as we wrote, and giggled as we shared our writing. We created such different pieces of writing from the same set of words! Fun writing games are always a hit in our house, and they’re by far the best way to inspire J(9) to pick up a pen. Over the last week we’ve got into a pleasant routine of meeting for afternoon tea while we play a game or enjoy a story. On Monday lunchtime we returned from a long weekend away, and I found myself ignoring the unpacking while I made scones to eat over a game of Consequences. I’m starting the school year as I mean to go on! What writing games does your family enjoy? Do you have a favourite teatime snack? I really enjoy reading about how you make learning so interesting for your children. Thank you for another inspiring post! I feel like they make it interesting for me, really, Hwee! We’re all in this together. 🙂 Thank you! Sounds like so much fun! I especially love the poem. Thank you, Phyllis. I passed on your kind comment to C(10) and she says “Thank you!”. A great reminder that even the tough subjects can be fun if you use the “write” approach. My C thanks you for this post. He was having a rough morning so we decided to play a reading game instead of tackling the book he was working on. I’m wondering if I can make all learning playful, this year..?! Sorry to hear about the insomnia, Loraine. Thanks for the love. Hope you sleep soon! Thank you so much for sharing the fun writing ideas! I am downloading PopWords! right now! Fun! Nikki, I just noticed that my reply to your lovely comment was eaten by wordpress – I’m so sorry! I hope you’ve had as much fun as we did with PopWords! I love this idea! We don’t have Boggle either but I might try it by using Scrabble letters if I can. Thank you so much for sharing this with me on the #homeedlinkup and if you know of any other bloggers who fancy linking up then please send them my way. We all have so much to learn from each other. Thank you so much for hosting the only UK homeschooling link up that I know of, Prudence! I will definitely send any other bloggers your way! Games are wonderful, aren’t they? And it’s so much easier to write when we’re not starting with a blank page! Wow! I love the start of your story. I want to read more. Perhaps you could continue and write a NaNoWriMo novel in November. What I love most is the way you joined in with all the writing fun. I think kids enjoy it when we have a go as well. And we end up having a great time too! Thank you so much, Sue, you are very kind. I must admit I really enjoy writing ridiculous stories! I think that’s why I enjoy playing Consequences with my kids so much. It’s lovely to share fun activities with our children, isn’t it? Ha! I think even my son would enjoy this! We have been trying something (very vaguely) similar with story stones. Each stone has a Native American pictogram on it and the children have to make up a story based on those pictures. Fun, fun, fun! I love how you tie your activities together into unit studies, Claire. I’ve really been enjoying following your Native American posts. Great idea! Perhaps this would be great for my daughter as a way to practice the words she misspells in her journal writing…Possibilities! Great idea, Jessy! This would definitely be one of the more fun ways to practise spelling words, I reckon! Sounds fun Lucinda. I just signed up for her emails!!! Keilee LOVES creative writing. Great job on the movie trailer and the poem. 🙂 And of course your story. Isn’t it fun to learn along side of them? Thanks, Karen. 🙂 Keilee has such a a great imagination, I bet her stories are wonderful. I so enjoyed her invitations to your tea party! We love Brave Writer too! I haven’t tried her Boggle activity but, judging by your success with your children, I might be trying it soon. Hi Sam, It’s lovely to “meet” another Brave Writer mum. I just popped over to your blog and I was pleased to see the large “Brave Writer” tag in your tag cloud (along with the Pokemon one 🙂 )! I shall be over for a good browse very soon. Are you on the Brave Writer Lifestyle Facebook group? I’ve really enjoyed connecting with other BW mums over there recently. My daughter has even found a like-minded penfriend thanks to the group! Ashley, Thank you for your lovely comment – it’s made my day! We are really into the swing of teatimes now! I love thinking up fun teatime activities. Recently we’ve made up our own Mad Libs stories, played Telephone Pictionary and explored opening hooks – as well as had poetry tea, of course. J(9) asked to play the Boggle-inspired writing game again last week. It’s so much easier to write when you’re not starting with a blank page! How old are your children? I’d love to share ideas for fun teatime activities. You’re very welcome. I’m glad I could make your day. 🙂 My daughters are 8 1/2 and 1 (16 months). This has prompted a desire in me to search out a pretty tea set (adult size). I could see this being a disaster with the toddler. ;\ I’m going to try the writing game today with my 8 year old. I’m sure both your girls will love a pretty tea set. We used to share poetry tea with another family. With seven of us around the table we had a proper pot of tea. It’s what got C(10) into drinking tea, actually! Now it’s just the three of us with our different drinks I have to find new ways to treat myself. I bought some lovely tall latte glasses in Ikea last week (together with a fun £1 milk frother gadget!) so they are making our table special this week. 🙂 I hope you both enjoyed the writing game!